Journey deep into Antarctica into the lesser-visited Weddell Sea. This is a pristine area of Antarctica, where only a fortunate few have visited. It boasts huge tabular icebergs and an uncompromising environment reserved for rare and unique wildlife. 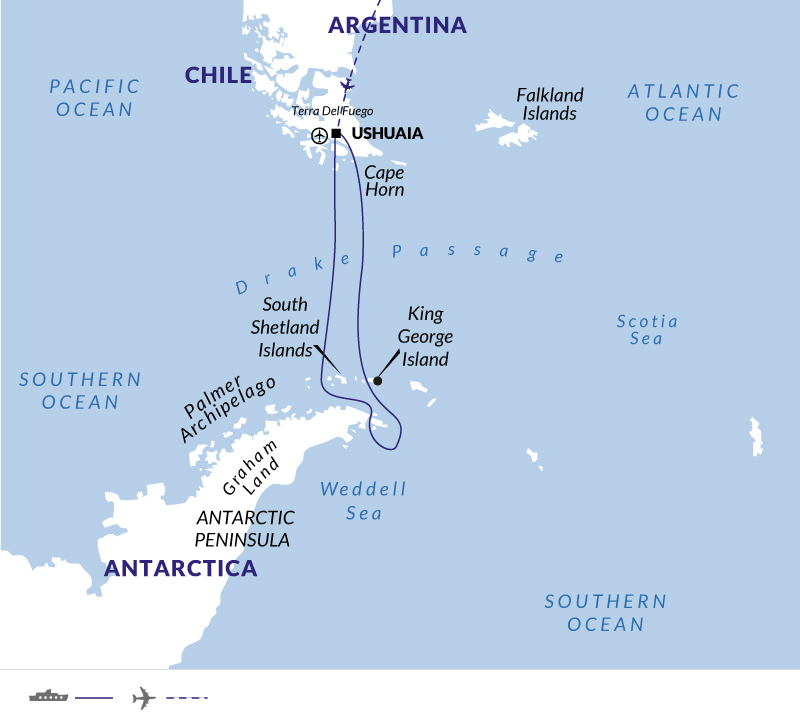 It was here that polar explorer Ernest Shackleton travelled on his quest to conquer this inhospitable environment. During your cruise, you'll have time to explore these eastern flanks of the peninsula and to observe penguins, seals, whales and sea-birds at close quarters. Dress on board is informal. Pack comfortable, casual clothing for all activities. Wind and waterproof outer layers are essential, and the most important piece of clothing you will bring is a parka. Beware of tight clothing that leaves no room for trapped air, which is an excellent insulator. Wool, silk and some of the new synthetic fibres, like polar fleece, retain heat better than cotton. You should look for a lightweight, roomy, wind and water-resistant parka with some insulation. Bright colours are more visible - and thus safer - in polar environments. Keeping your hands warm and dry can be a challenge. Thin polypropylene gloves can be worn underneath warm outer gloves. This allows you some protection from the cold when removing your gloves to operate your camera etc. We strongly recommend that you bring more than one pair of gloves, in case one gets wet (or lost). Water-resistant trousers of coated nylon or, even better, Gore-Tex® are essential for your comfort. They can be worn over your regular clothes to keep you warm and dry. We suggest that you purchase trousers a few sizes larger than you normally wear as you will be wearing them over other clothing. Gore-Tex® or similar fabrics are excellent for keeping out wind and water without trapping excess heat. Rain gear and Gore-Tex® products can be found in any outdoor sport clothing store. In addition to your waterproof trousers, warm ski pants are suggested if you have them. Warm trousers such as jeans, corduroys etc. are also good. Thermal underwear is highly recommended as it will keep you warm without adding bulk. The electrical supply on board the Ushuaia is 110 volts, 60 hertz. Cabins are fitted with multi-type sockets suitable for several international plugs (not British. It's advisable to take a multi-way international adaptor. Built for the US agency NOAA (National Oceanographic & Atmospheric Administration), the Ushuaia has been constantly modernised and refurbished whilst operating in Antarctica. The Ushuaia is an ice-strengthened small ship, accommodating just 88 passengers; making it a comfortable and steadfast choice. Knowledgeable staff will ensure you get the most out of your visit and there's an open bridge policy plus ample deck space for wildlife-viewing.